Introduction: what makes magic everyday magic?, Kathryn A. Edwards; Magical lives: daily practices and intellectual discourses in enchanted Catalonia during the early modern era, Doris Moreno Martínez; Lived Lutheranism and daily magic in 17th-century Finland, Raisa Maria Toivo; The guardian angel: from the natural to the supernatural, Antoine Mazurek; False sanctity and spiritual imposture in 17th-century French convents, Linda Lierheimer; Magic, dreams, and money, Jared Poley; The good magicians: treasure hunting in early modern Germany, Johannes Dillinger; A Christian warning: Bartholomaeus Anhorn, demonology, and divination, Jason Coy; The ‘antidemons’ of Calvinism: ghosts, demons, and traditional belief in the house of François Perrault, Kathryn A. Edwards; The constitution and conditions of everyday magic in late medieval and early modern Catholic Europe, Sarah Ferber; Index. Kathryn A. Edwards is Professor of History at the University of South Carolina, USA. 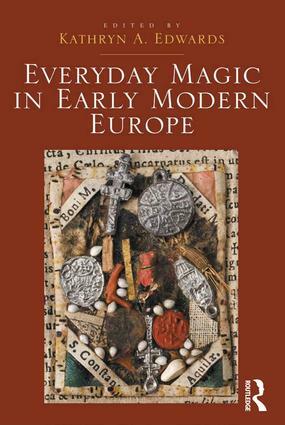 Her publications include Leonarde’s Ghost: Popular Piety and The Appearance of a Spirit in 1628 (2008; coauthored with Susie Speakman Sutch), Werewolves, Witches, and Wandering Spirits (2002; editor), and Families and Frontiers: Family and Communal Re-creation in the Early Modern Burgundies (2002). She is finishing a book on ghost beliefs, Living with Ghosts: The Dead in European Society from the Black Death to the Enlightenment.